During my most recent tours through Morocco and South America I switched from a classic pannier setup to a bikepacking system. Price 20,- Size: 3-10 l Weight:? What you receive for the money seems to be a fair bag, convenient in size and optic. Also the clip closure seems to have a convenient quality. It comes with many small details, such as small side pockets, which doesn’t really seem to be too useful, especially as you can’t open them once the bag is loaded. The cheap price becomes visible, when it comes to the mounting. The stripes to fix the bag on the saddle are made with simple seams. In compare to most other bags it only got one Velcro stripe to fix it on the seatpost. On the trail this might let bounce the bag around more than necessary and seems relatively less reliable. First impression: For the price seems to be reasonable. No doubt that this is not a bag for a world conquerer, but for commuters and Sunday afternoon bikers could be a fair option. Before I bring this bike on the road I will already reinforce here and there. With 40,- the second cheapest of the bags, but almost at the same price level at the ROSE TRAVEL (50,-). Even if 10l should fit in – and against the optical impression – it’s a bit smaller than the BeSoul and so the smallest capacity of all tested bags. All over it looks like a budget bag with a mature concept: A simple rolling bag without any extra features. The PVC is stiffer and more heavy than the Ripstop or PP-textile on the other bags. A Velcro at the upper end of the bag allows to close it while packing, which is a simple and helpful detail. To prevent damages on the bag I already duct taped the part where the bag meets the seat post before riding it the first time. This duct tape was completely done after about 250km. On longer rides this would be a problem pretty sure. In conclusion I would consider the Rhinowalk as a convenient solution for the daily way to work with fair money for value. For longer rides I would recomend to invest a bit more money and go for a higher quality option. Anyway the next more expensive in my little test is the Travel Bag from RoseBikes which seems more solide and handy for one 10,- more. The mount on the saddle seems to be much better made than the BeSoul. The stripes under the saddle are solid made. The stripes under the seat are longer than on the BeSoul and the Ortlieb, which makes it more comfortable to mount and release. Two broad stripes fix the bag stabile at the seat. Only a closer look shows some weaknesses. I know a bit about PVC sealing and it doesn’t look well made at all parts. Especially load carrying components, like the stripes to close the bag are sealed, not seamed or additional supported. That looks not very reliable. Before really trying them out, the system with a cage and a dry bag seems to be more comfortable as the bike is loaded in seconds. Bag and cage seems to be solid and allow to add additional stuff outside the dry bag. Thanks to that it becomes relatively heavy with 430g. According to the product information this bag got a capacity of 8 l. In reality it’s still a bit bigger than the BeSoul or the Rhinowalk, which should have a capacity of 10 l.
Unfortunately there is only one stripe to fix the bag at the seatpost. The first impression is weight and volume of the bag. 350g for the second biggest bag is a blast. Therefore everything on this bag is very minimalistic. The cage is not much more than a solid metal stripe along the seatpost and saddle with three stripes to fix the dry bag. The dry bag is very thin and got an specific form to fit in the cage. To replace the dry bag will be hard with everyone but the original VauDe one. First impression: For long journeys with a heavy loaded bike the much cheaper ROSE bag seems to be more reliable. For all light bikepackers, commuters and weigh fetishists this is a 100% match! When talking about Ortlieb, we don’t have to talk about quality. Even after about 100 days on the road it looks like new. Every stripe and rivet is additionally reinforced. The construction is all over very solid. The stiff construction is resistant against any deformation. Unfortunately it also makes the fitting on the seatpost a bit complicated. 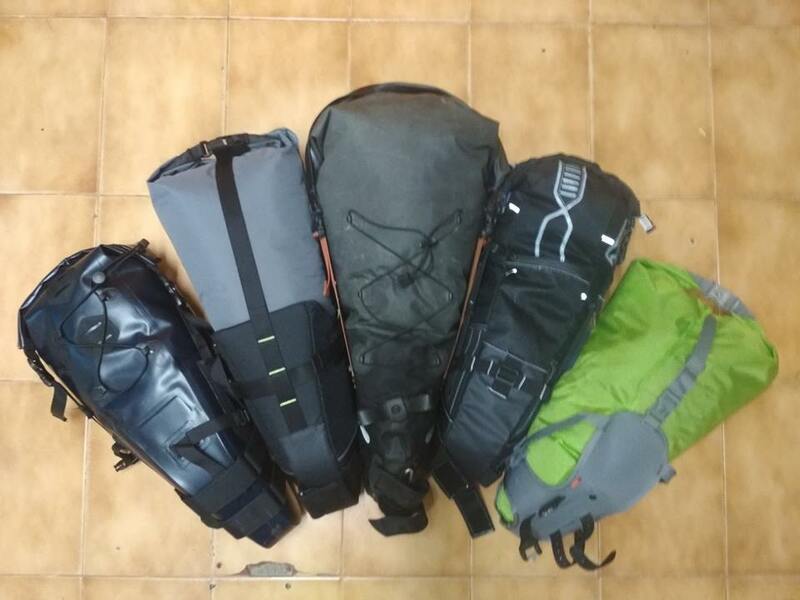 In compare to the dry bag system from ROSE and VauDe that plays an important role, as the bag normally is removed frequently on longer travels.